A little while ago I discovered on the web yet another design for an active wideband receiving loop antenna, by Chavdar Levkov. Chavdar clearly analyzed both the requirements that the amplifier needs to satisfy and the circuit that he built very carefully. Therefore, I hoped that this antenna would outperform my existing active wideband loop, which uses a different amplifier, designed by John Hawes. I use my wideband a lot; it is sensitive (much more than the active whip) and does not require tuning (unlike the tuned receiving loop and the transmitting loop). Therefore, I really welcomed the possibility of a more sensitive receiving antenna that would still not overload. 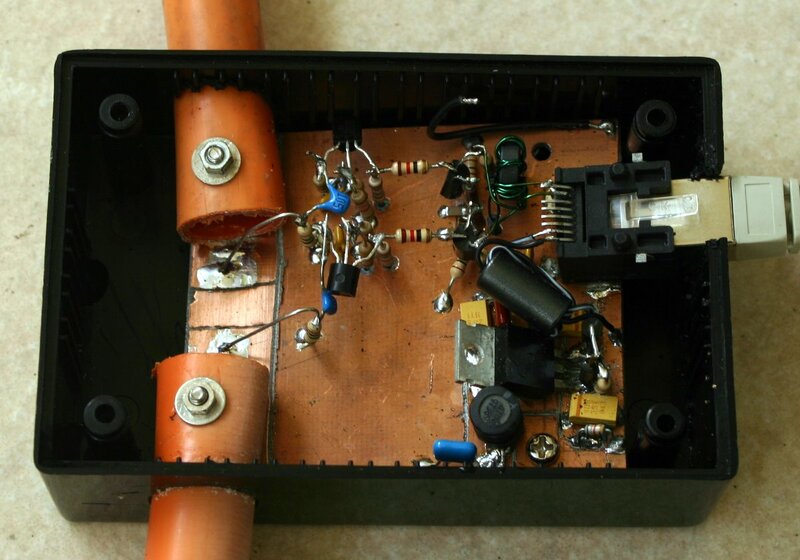 The basic difference between Chavdar’s amplifier and John Hawes’ is that Chavdar’s input stage is a grounded base amplifier with a very low input impedance, which matches the impedance of the loop better than Hawes’ common emitter amplifier. The grounded base amplifier drives a common emitter stage, so Chavdar’s amplifier is also a bit more complicated to build, but not by much. When I wrote to Chavdar with some questions on his design, he compared it to Hawes’ and wrote back that he thought that his own design has higher dynamic range and higher gain at lower frequencies, but perhaps also more noise at high frequencies. I decided to give it a try (particularly since I wanted another antenna of this type anyway, because the existing one is tied all the time to a WSPR spotting activity). Before I could pu t the sockets into the circuit, I had to figure out how to ground the cable shield on the receiver side but not on the antenna side. Until then, I never paid any attention to shielding in these cables. I looked at one plastic connector connector and couldn’t figure out where the shield connection was. It was not there at all, because some of these cables are unshielded (they are marked UTP) and have plastic unshielded connectors. 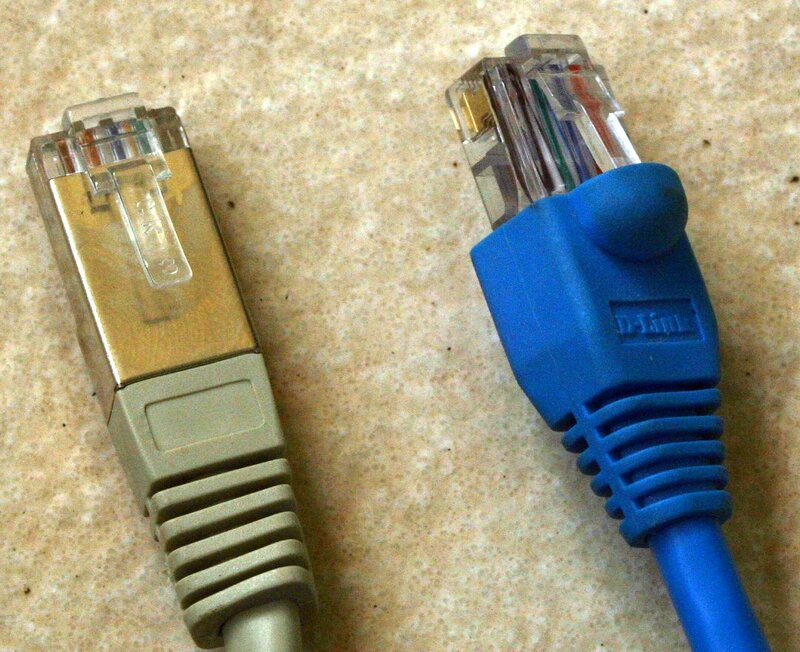 Shielded cables, marked STP or FTP, use connectors with a metal shield that’s connected to the cable’s shield. After I figured this out, I mounted the two sockets; on the receiver side, I mounted a metal-shielded socket by soldering it to a scrap PCB; on the antenna side, I super-glued a plastic socket to the PCB. The rest of the construction is pretty similar to the way I built Hawes’ amplifier, both in terms of circuit construction and in terms of the enclosure and loop connection. 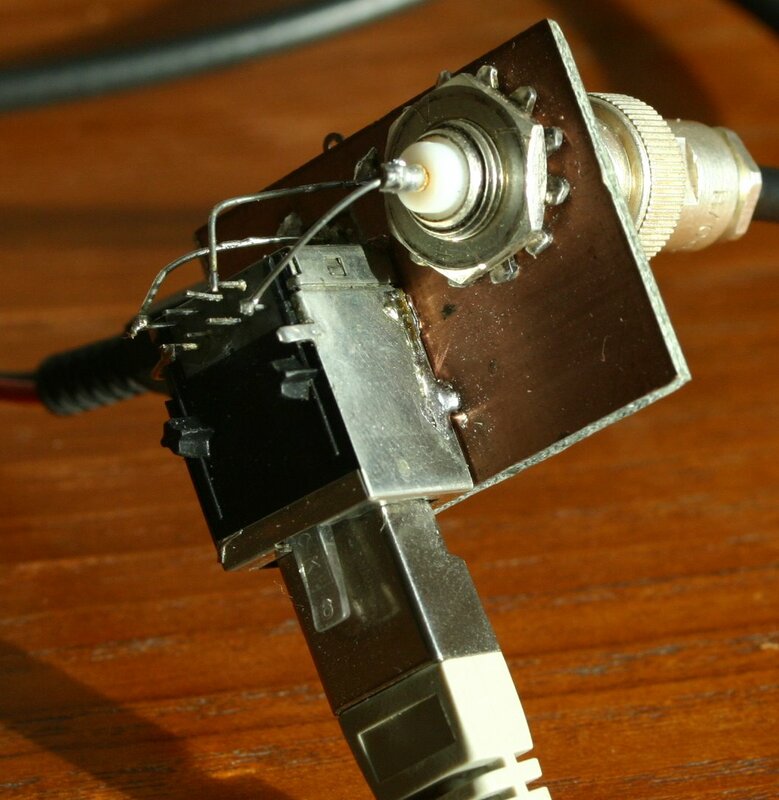 Chavdar’s design used a 10V regulator on the antenna side, powered by an 12V input supply. Chavdar used a 7810 fixed-voltage regulator which I did not have, so I used an adjustable LM317 regulator. This caused me a some problems. I initially put a REG1117 regulator in the circuit. It promptly died. I replaced it and the replacement also died almost immediately. At that point I read the data sheet more carefully, and realized that the regulator needs 2 protection diodes if it is used with large-value capacitors. I used a 10μ tantalum cap on the input terminal and 22μ tantalum caps on the output and adjustment terminals; these caps can easily provide enough current to destroy the regulator when you power the unit down, and they did. I then put in the diodes, replaced the dead REG1117, and put in a new regulator (this time an LM317, but I could have used a REG1117). Now the regulator section works fine. On the receiver side, you need a unit with an RJ45 socket, BNC to connect the receiver, and DC power input (and some filtering for both, which I did not yet put in). I initially mounted all 3 sockets on a piece of PCB, for lack of an appropriate enclosure. A little later, I realized that since the amplifier unit contains a voltage regulator, there is no need to power the amplifier using a regulated 12V supply; an unregulated one would work just fine. I therefore added a little mains transformer, diode bridge, and filtering (a pi network with two electrolytic caps and an inductor on the receiver side. There’s still no enclosure, but it’s more convenient than before. It looks weird, but it works. I did not compare the antenna carefully to the one with Hawes’ amplifier. The loop element I used in both antennas is exactly the same, so comparing the antennas should show any differences between the amplifier circuits. But I have not done that. In casual listening, the antenna performed very well. During the SSB context over the weekend, I was able to hear many US SSB stations; I never heard any with the Hawes loop at the same location (ouside 1st floor balcony in an urban area about 10,000km from the US east coast) . This does not say much, because the contest brought many strong stations to the air, and propagation conditions were good over the weekend. But this definitely made me happy. The antenna performed fine from 3.5MHz to 24MHz (28MHz was closed when I was listening). It also receives the airband (VHF AM) and 144MHz and 430MHz, but on these frequencies it’s a little less sensitive than a 144MHz dipole. It works on MF, but not as well as I hoped; I can receive BBC World on 1323kHz, but not as well as in my car. I now agree with Chavdar that using networking cables and connectors for receive antennas is a good technique. I plan to replace the cabling in my tuned-loop amplifier, because it needs not only RF and power, but also tuning voltage for the varactor diodes; on a CAT5e cable, I can just use a third pair for the control voltage. I am indebted to Chavdar for both putting the design and the detailed analysis on the web and answering all my questions via email; thanks! chavdar is a very good fellow indeed, i have also had help from him. also please take a look at the publications of dr glenn s smith. he also is an authority on loop design and other antenna technology.